There is just something so comforting about a hot cup of tea. Whether you are enjoying a cup to help you get through some sort of illness, or you are just trying to unwind after a long day, having some tea can do so much to help relax and comfort. I have never been a huge tea lover, but do enjoy a cup every now and then. 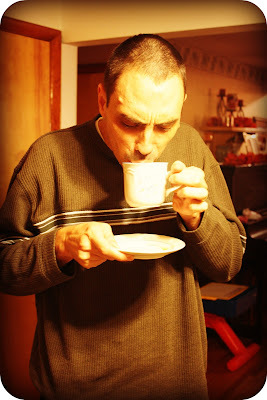 My husband actually has been drinking tea lately because he heard that it is good for him. He is not the most healthy eater so you can imagine how happy I was to hear that he was doing something that was good for him. I have been thinking about what a great gift idea tea is. I mean, you can make some really gorgeous gift baskets for tea lovers...mixing and matching bags of tea and adding a few tea biscuits wrapped in colorful cellophane. Because of the large selection of teas available, you would have no trouble finding the perfect flavor for that picky person on your Christmas list! At Best International Tea we import only the finest teas from around the globe. 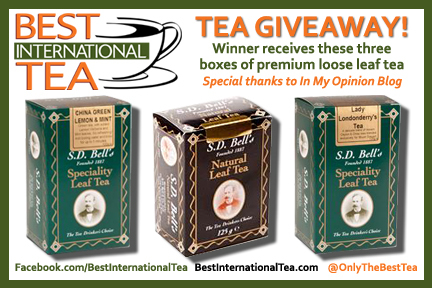 Best International Tea takes pride in importing these fine teas and bringing them to the US marketplace. Our black teas from the United Kingdom are rich in flavor and history. For over 125 years and four generations S.D. Bell of Belfast, Ireland has been blending exquisite black teas. The name S.D. Bell is synonymous with quality tea and is known as a worldwide leader in fine premium black teas. I am not very familiar with Black Tea and typically drink herbal teas; so I was very excited to be given the opportunity to try some of the teas from Best International Tea! So, for this review I was sent two boxes of tea. I was sent Lady Londonderry Afternoon Tea and the English Breakfast Tea. 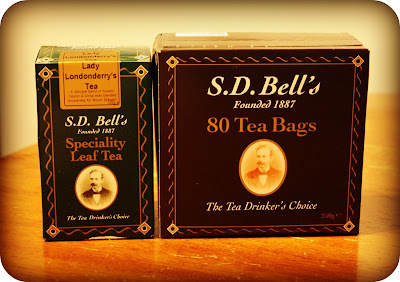 I have tried loose leaf tea before and love it so I was very excited to try the Lady Londonderry tea as it is a loose leaf tea. 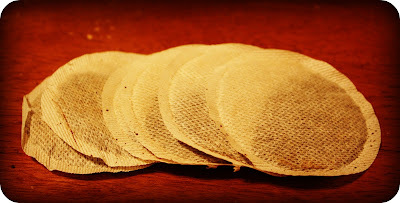 I love how the tea bags of the Breakfast Tea are round...it think it adds a really nice touch to a cup of tea. 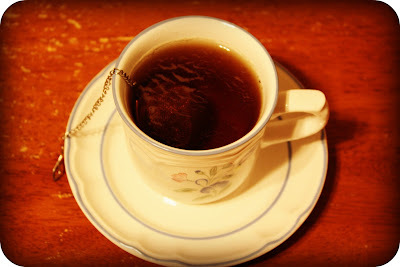 With a bit of honey, this tea was a wonderful treat for me. I am not an expert on teas but this tea tasted really nice. This is also Best International Tea's bestselling tea. While I very much enjoyed the English Breakfast Tea, my favorite was the Lady Londonderry Afternoon Tea. I enjoy loose leaf teas because to me, they just taste fresher. Whether they are or not, I am not sure but they sure do taste great! I filled my tea ball and submerged it in a steaming cup of hot water. All that was left to do was to remove the tea ball once my tea had steeped and enjoy it! So, in my opinion...Best International Tea has some really yummy teas. I love how each tea has it's own flavor and that they also carry loose leaf teas! If you are looking for a fantastic Christmas gift for a tea lover, look no further...Best International Tea has you covered! Disclaimer: I received no monetary compensation for this post.I did receive free Best International Tea products for review purposes. All quotes and stock photos are from the Best International Tea website and email. Prize is being provided and shipped by the sponsor. All thoughts and opinions are 100% mine. The China Green "Earl Grey" sounds great, too! The Lapsang tea bags or the china green gunpowder both look great! I would also like to try Assam ‘Top Tippy’ SFTGFOP tea. I would like to try the S.D. 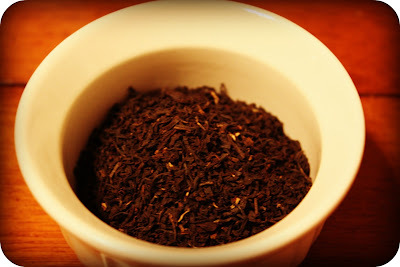 Bell Lapsang Tea. I would love to try their Formosa Oolong Tea.